Is it possible to achieve a 12.08% annual returns from your investments risk free? At 12.08% per year, your money is doubling every 5.96 years and RM1,000 invested a month would grow close to RM1 million in just 20 years. Most of you will probably think like this. Risk free? Impossible! No investment is 100% risk free! Well, according to Adam Khoo in his book “Secrets of Self Made Millionaires”, it is entirely possible! However, you cannot achieve this by investing in individual stocks, or simply choosing any unit trusts funds. Instead, Adam Khoo suggests this - invest in the whole of the US stock market! "What?! Are you nuts?" you exclaimed. Well, here’s a fact. The US stock market averaged an annual return of 12.08% per year for the last 20 years. This of course does not mean that every single stock in the stock market went up by 12.08%. It’s the average we are talking about. For the uninitiated, stock markets are actually measured by an index. An index is a portfolio of stocks that is designed to represent the whole market. The US stock market is represented by many indexes, but the most popular is Standard & Poor 500 Index (S&P 500). This index consists of 500 of the largest companies in the US stock market and represents over 80% of the total stock market value. So, this index actually indicates the average price of all 500 largest companies in USA and can be said to represent the overall performance of the whole US stock market. 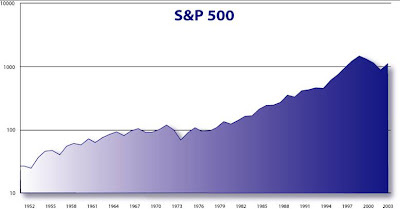 If we look at the S&P 500 index graph from year 1952 to 2003, we can see that it keeps moving up over time. Yes, there were some ups and downs, there were bulls and bears, but overall it keeps going up. This could be due to inflation as prices always increase over time, and this include stock prices. Secondly, due to the inevitable population growth, companies will always have more and more people to sell to so there will be increase in profits and therefore, an increase in stock prices too. Adam Khoo says that if we were to invest in a mutual fund that tracks the S&P 500 index (aka Index Fund) and keep investing, in the long term, we will have 100% chance of gain and zero chance of loss! The key word here is LONG TERM. And long term means at least 10 years and above. It seems the longer you invest, the lower the risk. If you invest for one year, you have 20% chance of losing your capital. If you invest longer for 5 years, your risk of loss is reduced to 10%. But if you invest for 10 years and more, the chances of losing is virtually zero! In other words, you can only gain and profit by investing for 10 years and more. According to Adam Khoo, you can buy the US Index Fund through online brokers available at Ameritrade.com, OptionXpress.com, or etrade.com. Just open an online account, send them the necessary documents and transfer funds into your account from your home country. Another alternative is to buy Exchange Traded Fund (ETF) that tracks the S&P Index 500. ETF is a kind of investment security that is constructed like a mutual fund but trades like stocks. It charges lower fees and can be bought or sold anytime of the day. You can buy ETF through online brokers at interactivebrokers.com. Well, what do you think? Would you want to invest in the US Index Fund if you have that extra cash every month? With the stock market falling to an all time low, this may just be your golden opportunity to buy cheap and make huge profits in later years. Now I am not an expert on investments. I only learnt about this from the Adam Khoo's book I mentioned above. If you are an expert on this, please comment and share with us your opinions and suggestions. but the US market is dropping, isnt it? Yalor...that book outdated liao! He wrote it when things were going great. Right now, probably gone into hiding! Can imagine many people wanting to kill him! Of course, in whatever thing you invest, the higher the risk, the greater the gain...or loss, whichever is applicable. So people willing to take the risk are the ones who MAY end up filthy rich...while the "careful" ones will forever remain poor. I'm very careful...won't even put my money in unit trust funds!!! That's why so poor! LOL!!! I think you have an interesting blog here. However WRT to your post I must prudently disagree. The US stock market is dropping terribly due to the current credit crisis gripping its banking industry. It will continue to lose even more value as long as this crisis is not yet overcome. It is simply suicidal to invest in ANY stock market right now. If anything investing in gold would be more profitable anytime than investing in their shares. carrot, yes the US market is at its all time low and may drop further. But companies with good fundamentals will survive and rise after all this is over. I agree with Warren Buffett's call to buy stocks now instead of holding on to cash as it is in fact common sense that inflation erodes the value of cash. What stocks to pick? Those with strong fundamentals and yield decent dividends are the safest bet. Bottomline: patience will yield gains meaning holding on to the stocks over an extended period. Of course, the more daring will zoom in and out of the share market for quick gains. This is risky but yields high returns. It is important to note one should never borrow to invest in the share market. I'd rather invest in the local share market than invest overseas. I was told to hold on until Dec to get in but I believe now is a good time to start accumulating. He also makes long term investment, but he invests in selected companies, not the whole market. And he actually does a thorough study for each company he pours money in. I agree with Happysurfer..never borrow to invest in stock market...invest if you have the cash. As with any kind of investment, it is imperative that one research the company first before buying its stock. So what kind of company should you invest in? One that has a great thing going on, like Intel. LOL (just kidding Foong :o) kinda) Anyway, one should invest now since there are a lot of bargains available. You should be in it for the long term though. After reading so many books, the best way to invest is still buy when everyone is fearful (market down badly). Of course, you must only choose good blue chips stocks! Interesting... I agree with you. Anyway, the stock market was overvalued and needed massive correction. I wish that I could figure out all this investment stuff. I still have trouble with my checkbook! The best thing is to avoid any investment schemes that you do not fully understand. it is risky and could lead you to losing hard earned money. better safe than sorry. I have no idea how to invest (if I had the money that is) even if it came and bit me on the nose! I agree with Khensiong. Buffett didn't invest in all companies but the selected ones. His plan is always to own the company or the least he could do is to get the biggest share as he could. 12.08% return is good even though some unit trust promise higher return. I might invest in others when my ASB account is full. Even though ASB is around 7-12% still not so bad. khengsiong, I guess you are right. Maybe we should not invest in the whole market at this moment in time. Because some companies will not survive this crash. my bug life, yes that's very good advice. Never ever borrow to invest. Only invest with your extra cash that you don't need. tekkaus, yeah it will definitely go up again, that's why people who see the opportunity always like it when the market crash. They will buy those fundamentally strong companies. nick phillips, pay me and I'll do the investments for you. Haha! Just kidding! I'm not an expert either, but I learn through books and speaking to those who are experts. 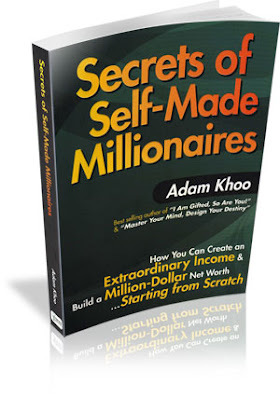 monica, well, you can start by reading books like this book by Adam Khoo. He's a self made millionaire at age 26, so he must be doing something right! Too bad I have no extra money to invest.